Frustrated in the search for a cruiser that has enough pizazz to make you want to get out of bed in the morning? Raku 32 is on a mission to break down the barriers between a cruiser and a high performance day sailing cat. We’ve set out to create the kind of boat that helps you to remember what got you inpired to take up sailing in the first place. Raku 32 has inherited a host of design features from our race boats and larger cruising cats. 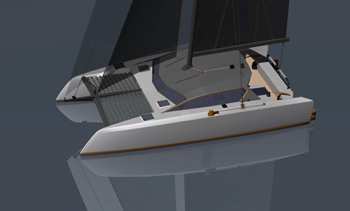 There’s 1.6m of headroom under the cabin top and 1.8m below in the hulls. We’ve teamed up wtih two leading composites companies to make Raku 32 available in kit form using their state of the art DuFlex panels in combination with West System resins, Diab’s PVC cores and a range of fabrics in glass and carbon. DuFlex kits and composite materials will be available world wide from ATL Composites in Australia and VDL Compostites in Germany. Plans and detailed building instructions will be provided by Grainger Designs. CE compliant engineering will be available with the plans. 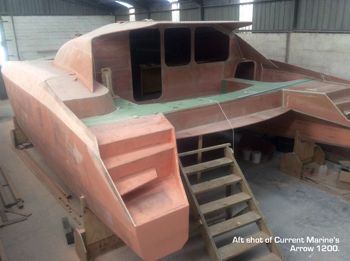 Over the coming months we’ll be working with marine professionals in various countries to provide a range of moulded components and professional services to complement the kits and allow Raku owners to start their project at the basic kit stage or order a professionally finished boat ready to sail. 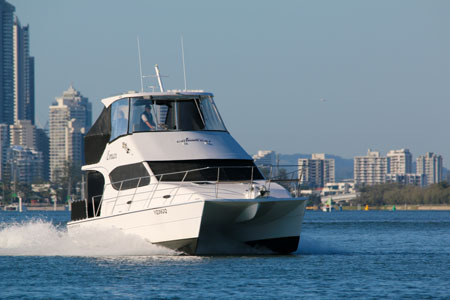 The Cruisecat was designed back in 2000 with the first vessel coming off the floor in 2002. I have always been passionate about the marine industry since I was seven years old where I built my first boat out of fence palings back in New Zealand, I even took a bet with my father that the vessel would float, albeit all of my pocket money. Fifty years later, I still get the same enjoyment of creating and designing vessels for the private and commercial sector for Australian waters. I am very passionate about my designs in creating the perfect vessel for my clients and continue to work with them very closely. In 2006, I was awarded ‘Apprenticeship Trainer of the Year’, the three apprentices are now fully qualified and still working within the marine industry as shipwrights. In 2008, I was awarded ‘Business Of The Year Award’ and ‘Manufacturing/Engineering Award’ for the Cruisecat vessel design. We as a business need to continue to strive to keep the marine industry alive and thriving. I understand that the marine industry is a very competitive market place. In such a competitive market the ability to change with the times as your customer’s requirements change is imperative. Flexibility is the key and the Cruisecat design provides the perfect platform for the client to build the boat of their dreams. This is why we have always custom designed and built to our client’s requirements. Cruisecat is synonymous with high performance, practicality and endurance and is leading the way with its contemporary yet classic exterior, spacious interior, versatile and comfortable galley and dining area with spectacular views from all angles. The innovative layout and use of space on the interior and the exterior provides an unprecedented level of comfort for cruising. Cruisecat is cost effective to buy, serious value for money and has an exceptional proven resale value to the client. The Cruisecat is an exceptionally classy power cat, and is a versatile vessel providing clients with the speed, endurance and full offshore capabilities, hand built and crafted to withstand the roughest of oceans. With high buoyance co-efficient hulls, low draft and high tunnel clearance allows the Cruisecat to move high payloads in rough conditions and very economically with offshore sea keeping abilities. She is one of the most comfortable and spacious multihulls on the market today. You will be hard pressed to find a similar vessel in the market place with the same capabilities as the Cruisecat. 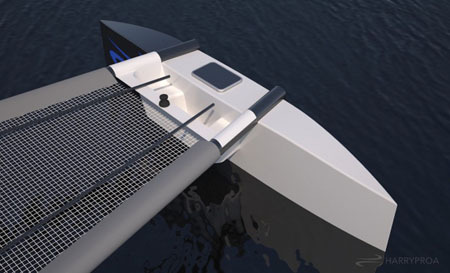 The Cruisecat is sure to impress the most discerning multihull buyer. It is critical to come up with innovative leading designs to stay in front of competitors in the challenging market of the marine industry. Builders need to appreciate that the avid boat owner can look beyond the bling on the imported vessel and they certainly know what they are looking for ... the Australian quality built vessels. We have seen an insurgence of potential clients looking for the Australian made vessel and Cruisecat has proven to be high quality, value for money, design and practicality. Cruisecat is stepping up production in 2018 and has new designs on its table for government and commercial applications. This has already sparked a huge amount of interest within the market place, even to the extent of global international interests. 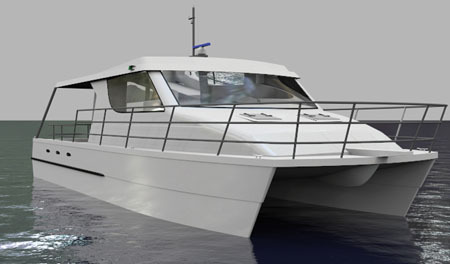 Potential clients are aware of the Cruisecat capabilities and the future designs and how they will play an integral part in the marine industry for the future of Australian boat building. We cater for the private sector, Cruisecat or houseboat, as well as for commercial surveys for bare boat charters, work boats and passenger ferries. All Cruisecat vessels are built to survey standards. There is currently no other power cat on the market that can perform to the standard of the Cruisecat. Pacific Blue Cruisecat recently attended the 2017 Sanctuary Cove International Boat Show, where we received a large amount of interest from clients looking for the perfect vessel. Clients were surprised that it was designed and hand build in Australia. Once they stepped on board the vessel they couldn’t believe the amount of room and space, together with the exceptional practical layout provided by the Cruisecat. One client couldn’t believe that they were standing on a vessel in that they believed that the walkway was more unstable than the vessel ... stability is the key! James has watched other competitors rise and fall within the industry. Some of those have been at a great loss to the industry as they take their skills and knowledge with them. The marine manufacturing industry is challenging at its best as we are bombarded by foreign imports of other vessels. 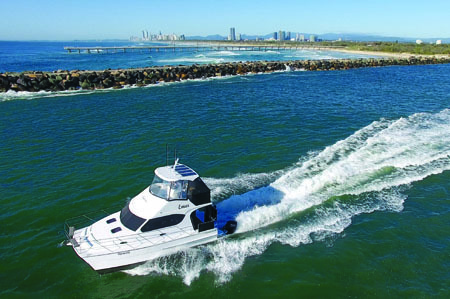 Pacific Blue Cruisecat was not looking to become a major boat manufacturer but a boutique builder where they can meet client’s requirements by developing a vessel that would cater for everyone in the market place. We make first class Australian made products located in Horizon Shores Marina, in the Gold Coast region. We have recently moved to larger facilities in order to cater for the current production program. The facilities provided at Horizon Shore Marina, with great management and staff is nothing short of excellent, it has that great community vibe. At these facilities we also provide clients with aftermarket support plus paint and fibreglass products to help both the boat builder and the DIY clients with our Boat Builders Warehouse shop, Pacific Paint & Fibreglass. Within our business structure we also facilitate a marine survey division and marine consulting services. It is important to have a detailed inspection of a marine vessel in order to ensure that the vessel is safe for the conditions in which it is designed, and what repairs or maintenance is required. Always ensure that if you are purchasing a vessel or going to undertake repairs – always check. Some of our associates are accredited naval architects and marine surveyors, AMSA approved. Should you have problems or any queries in relation to mono/multihulls vessel we are more than happy to assist with professional advice. If you are fter the perfect multihull to suit your requirements then look no further than the CRUISECAT POWER CAT. Talk to us about what best suits your needs. To enable people to compete in multihull offshore races at reasonable cost, with a very high chance of finishing and a good chance of winning the 40ft/12m division. To achieve this, the boat has to be low cost, fast, safe and simple. The only boat that fits these criteria is a harryproa. Harryproas are sailed the same as other boats, except instead of tacking or gybing, you shunt. Ease the lightly loaded sheet, pull in the new one and sail off in the opposite direction. A little slower than tacking or gybing, but much safer, especially in a blow. Bucket List is 12m long, 7.5m wide, weighs 700 kgs and has 57 sqm of sail on an 18m mast (40ft long, 25ft wide, weighs 1,540 lbs and has 600sqft of sail on a 60ft mast). This is far lighter than any other 12m multi. The hull shapes are optimised for speed, rather than easy tacking (not required on a shunting boat) and with their flat bottoms, they will plane in the right conditions. 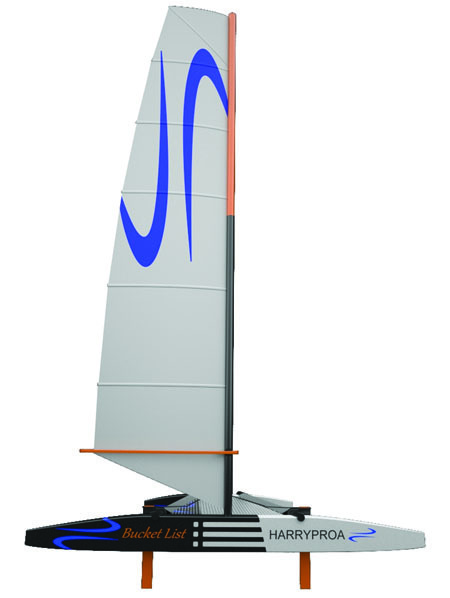 Light air speed is about mast height (there is more wind up high), sail area and wetted surface. 18m, 57sqm and 9.5sqm/100sqft are a combination which will be very quick. In medium air it is about power to weight (Bruce #) and minimising drag. A loaded Bruce # (imperial) of 2.1 is high. Frontal area is 2.7sqm is very low. Strong air is about righting moment. Bucket List will theoretically fly a hull in about 12kts of breeze (less if the crew sit to leeward), but because of the flexible rig, the actual hull flying wind speed is closer to 20kts, which is fast cruiser territory. Two rudders are less drag than two rudders, two boards and their cases. Less again as the rudders can be lifted for flat water or off the wind sailing, balance, shallow water or riding out a storm. They also allow the boat to be crabbed upwind to squeeze round a mark or climb out from under a windward boat. Bucket List has a fuse on the main sheet cleat which releases at 30° of pitch or heel. If it does capsize, the buoyant mast stops it going past 90° from where the buoyant boom will right it without the crew getting wet. The rudders kick up in a collision or grounding and are easily lifted, resulting in a 100mm draft with nothing to trip over on a breaking wave, and the ability to surf up the beach and step ashore as a last resort. Large, easily replaced foam/glass buffers on the hull ends minimise collision damage. The single sail rig means you never have to venture outside the beams. There is no dangerous foredeck work, and none of the dramas associated with extras. The wishbone boom is above head height if you are on the tramp. The hulls are foam cored and compartmentalised. Even if it was severely holed, Bucket List would still float and could still sail. The flexible mast automatically dumps power in an unexpected gust. The absence of stays means the sail can be reefed, raised, lowered or totally eased on any point of sail and any wind strength. 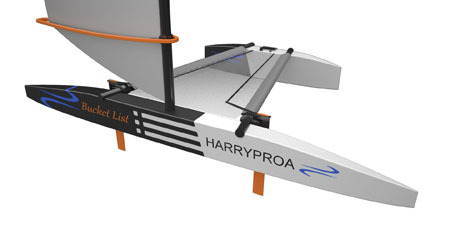 Harryproas have 1.5 hulls rather than two or three so they are the lightest, hence cheapest multihulls. Smart design has reversed the design spiral to make everything lighter and cheaper, leading to further weight savings, smaller rig, lower loads and so on. Bucket List is built from the highest quality resins, fabrics and cores, all vacuum infused using low labour techniques, an example of which is that there is no fibreglass grinding, no sanding and no post infusion laminating required. The finish is workboat rather than showroom. Not only much cheaper to buy and apply, but quick and easy to repair. Low cost also requires simplicity. An unstayed mainsail only rig, with four lines to control it via one single speed winch. The only other deck gear is the compass. The halyard has a simple, reefable lock, and a single reef line is used for all the leech reef points, without having to lower the sail to rethread it. Accommodation is spartan, but adequate for people who want to race fast. See OPTIONS if this is not you. Bucket List uses oversize, beam mounted rudders instead of daggerboards. This has been a harryproa feature for 15 years, works well and is much lighter, safer and cheaper. Bucket List is engineered, designed and built not to break. This is easily said, but actions speak louder than words. We will replace anything on the boat that breaks, apart from collision damage. This should make it one of the few racing multihulls that is insurable. The cost savings are not just from the build and low insurance. They extend to near zero maintenance. The living area is small and completely open and the rest of the boat is sealed compartments. The rig has no fallible components and apart from the sail, nothing to wear out. Feedback (and belated common sense) indicated that Bucket List would be uncomfortable to sail for long periods. So we added a cockpit. It increases the weight by about 15kgs, but it is in the right place, to windward. The great thing is, that it can be removed and stored in the little hull, so we still get four boats in the container. Four boats can be stored in a shipping container rather than leave them exposed to the weather and potential theft in a marina, with regular scrub offs and annual haul out for antifouling. The container only works if the boats are extremely easy to assemble and launch. This can be done by two people in one hour, with no tools, cranes or machinery required once the container is off the truck. The boats can be launched from a ramp or a beach on their custom trolleys. A container of four boats can be shipped to and from any major port for $1,500 per boat or easily trucked to inland venues like the Swiss Lakes for the Bol d’Or or Chicago for the Chi-Mac. Bucket List costs $US50,000/40.000 Euros, ready to sail. This includes the two hulls, trampoline, sail, jackline, all rigging, compass, winch and carbon beams, mast, rudders and boom. All painted and antifouled. It also includes anchor, chain, warp, fenders, mooring lines, nav lights, batteries, solar panel, tracker, vhf and outboard motor. To reduce corrosion issues, these items are all easily removed from the boat when it is not in use. It is expected that most users will have all or some of their own wet weather, navigation and safety gear. We encourage them to use it. For those that don’t, it can be hired as a separate package. In order to debug the boat and the usage system, the first one will be based on the Gold Coast, Australia from where it will be available for all the east cost Australia races. Once proven and finance permitting, a fleet of four will be established in St Malo, France where they will be available for European races. In the winter, they will be shipped to the Caribbean for the season there. To minimise the paperwork and place the responsibility for the boat on the user, the boats will be sold for $US50,000, with an agreement to buy them back at a set price in a set time, less any collision damage. The buy back price is calculated at $500 per day of ownership. So, if you want a boat for the seven days of Hamilton Island Race Week, the buy back price will be $50,000-(7 x 500=3,500) = $46,500. What you do with the boat during your ownership, is entirely up to you. This arrangement and the costs are not set in stone, but do seem to be the simplest way of getting people racing. For those who want a skipper or crew, Rob is available. $100 per day plus travel costs. Negotiable downwards for interesting or exciting races, which is pretty much all of them at this stage. • Freight Gold Coast to/from Aus east coast incl Melbourne: $2,000 each way. We are eager to build the fleets so time share ownership is encouraged. For the first 50 days use, there will be no fees. After that, we take 10%. There are no limits on owner days. Anyone wishing to buy a share in a boat for an equivalent share of its net income is welcome to apply. As is anyone interested in setting up a boat or a fleet elsewhere in the world. Full naming and signage rights of a single boat are available for $100 per day that the boat is used. Naming rights for the type (ie Volvo 65) are negotiable. The early publicity for the boat should be significant, so the sooner this option is realised, the better the return. Strong wind races or deliveries: The top mast can be removed and the reefed sail used. The reduced weight and windage aloft will increase the speed and reduce the potential for drama. 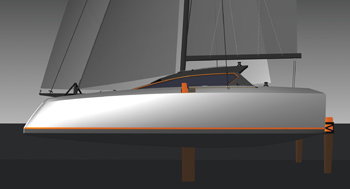 Light wind races: The top 6m section of the mast can be replaced with a 12m section and a 76sqm mainsail, giving a Bruce number (imperial) of 2.5. Bucket List can also be supplied with shorter beams and a larger windward hull, containing two double bunks, headroom, galley and a cockpit for four. 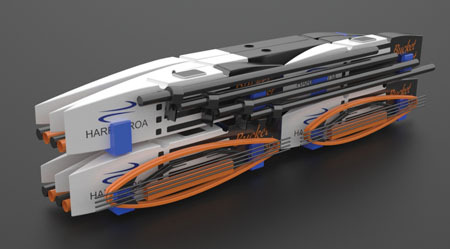 This would be suitable for longer races or cruising. The innovative Arrow Series caused a great deal of interest when the original 1200 design launched in 2014 featuring 100% flat panel construction, and since then the Series has grown to include a 1360 (13.60m) and 1500 (15.00m) version and a smaller one will follow soon. It is clear that the new construction method utilising only flat panels appeals to a wide range of customers, and now that both the 1200 and 1360 designs are under construction – we’ve really seen how fast the kits can be assembled. 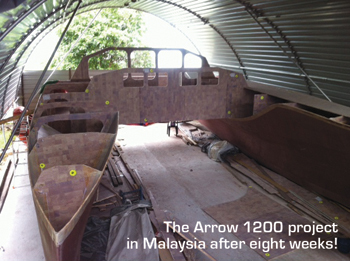 Professional yards and amateur home builders alike have been reporting fantastic progress after only a few short months, with the Arrow 1200 in Malaysia achieving both hulls turned with the bulkheads standing in a mere eight weeks! The tally of Arrow projects continues to grow, with the count currently standing at nine Arrow 1200’s, three Arrow 1360’s and an Arrow 1500 due to start in February 2016. These projects are located all over the world including Australia, Asia, South Africa and Europe. ACM Yachts are a professional Australian boatbuilding firm that has undertaken an Arrow 1360 project, with a modern factory located in the recently upgraded facilities of The Boat Works in Coomera. Jamie Morris is the owner and manager, a quality boatbuilder with a range of projects under his belt and a qualified team by his side. Being located within the sprawling Boat Works facility with a range of marine services and suppliers on hand, ACM Yachts are well positioned to produce some beautiful vessels and no doubt many happy owners in the future. Northstar Yachts in Cape Town South Africa, is also progressing on a new Arrow 1360 build for a client from the USA, alongside a sleek G-Force 1500C design being built to CE certification. Founder and manager Ashley Dee is an experienced Australian sailor who has a background in commercial shipping and shipbuilding projects. The Northstar Yachts team specialise in composite multihulls, with tight quality control, attention to detail and an impressive factory that can accommodate four 15m vessels or two 15m vessels and one 18m. 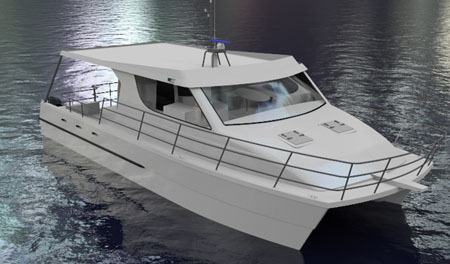 The G-Force 1500C currently under construction will be a demo boat, and used for marketing, testing equipment and fine tuning on board systems. In addition to the Arrow projects being undertaken by professional builders, there are a number of amateur home builds underway, some very well progressed already. The Loehr family located in Dusseldorf in Germany, have, with the help of a professional builder, reached a lock-up shell stage with the internal furniture installed and have fairing underway. A new Arrow 1200 build is kicking off less than an hour from the Schionning Designs office in Port Stephens, NSW and this is an exciting opportunity to document an Arrow build project from start to launch. With so many of these designs now under construction, it is only a matter of time until we see many hitting the water and proving their performance capabilities. > If you’d like more information on the Arrow Series designs, the projects currently underway or to see more images and videos, please visit the Schionning Designs website.